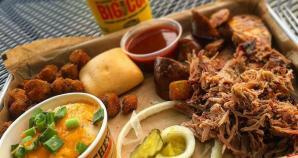 Taste why Dickey’s Barbecue has been the world’s best barbecue since 1941! Try our 8 juicy, hot, pit-smoked meats, like our southern pulled pork or our family recipe polish sausage. We even offer 11 home-style sides, like our creamy coleslaw and fried okra. Don’t forget we’re also your catering experts! Any event, any size – let Dickey’s do the cooking, and you can take the credit. Graduation parties, weddings, office functions, you name it! Dickey’s Barbecue is the perfect catering choice for groups of all sizes – from 10 to 10,000! Kids Eat Free Sundays with the purchase of an adult meal & everyone enjoys FREE ice cream every day!